A review in 10 words (or thereabouts): A tale of growing up with Buster Keaton. In the summer of 1908, in Muskegon, Michigan, a visiting troupe of vaudeville performers is about the most exciting thing since baseball. 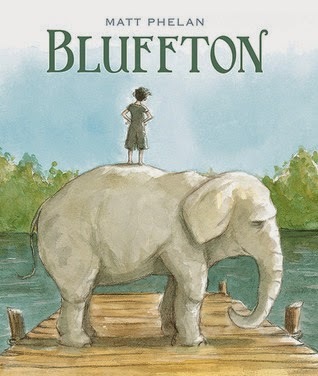 They’re summering in nearby Bluffton, so Henry has a few months to ogle the elephant and the zebra, the tightrope walkers and — lo and behold — a slapstick actor his own age named Buster Keaton. The show folk say Buster is indestructible; his father throws him around as part of the act and the audience roars, while Buster never cracks a smile. Henry longs to learn to take a fall like Buster, "the human mop," but Buster just wants to play ball with Henry and his friends. With signature nostalgia, Scott O’Dell Award–winning graphic novelist Matt Phelan visualizes a bygone era with lustrous color, dynamic lines, and flawless dramatic pacing. I wish I could go back to the days when my summers were free. I look fondly on the times when my days were my own. I could explore, play games, get into good-natured mischief from dusk until dawn. The artwork is fantastic, transporting you back in time to a small town and the joys of summer. The water color approach was definitely pleasing to the eye, and the historical elements really pulled the whole story together. This is a great read for kids and adults.